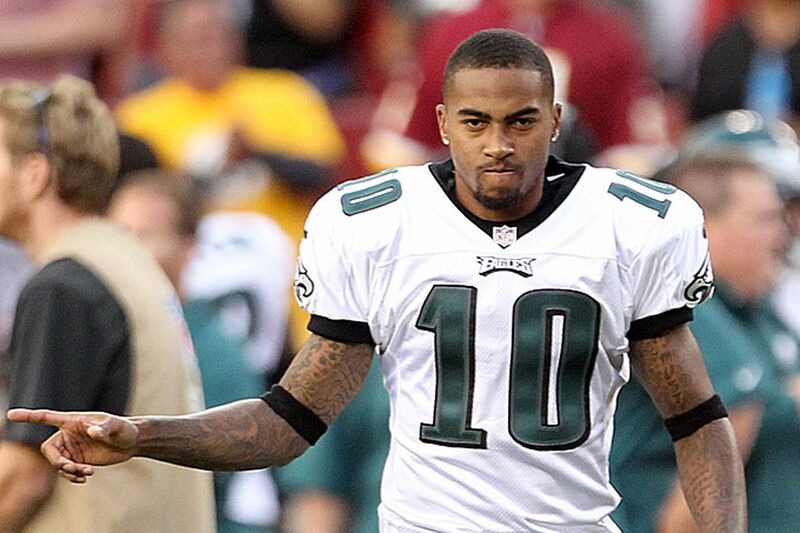 AS DeSEAN JACKSON visits the Redskins today, with a source close to Jackson saying the Raiders are next in line, I keep thinking about those 40 minutes. I'm talking about the time that elapsed Friday between the posting of NJ.com's story attempting to connect Jackson with the Crips and the Eagles' 25-word announcement releasing their three-time Pro Bowl wide receiver. There is no way Jeffrey Lurie, Howie Roseman and Chip Kelly conferred, made such a momentous decision, and crafted the announcement in 40 minutes. NJ.com had asked the Eagles to respond to the story's allegations on Wednesday. It's pretty clear that the Eagles' brass, unable to find a trade partner at the NFL meetings in Orlando, Fla., decided that this pending story about gangs was most fortuitous. They would hold off releasing Jackson until the story broke. Then, with gang innuendo providing cover, they would make their move, to dramatically reduced outrage. One of the most common responses on social media Friday was to assume the Eagles were getting out ahead of something, that Jackson was part of some pending investigation by law enforcement, that more revelations were coming. Surely other teams, after declining to trade for Jackson, would move very cautiously in such an atmosphere, while assessing whether to sign him. But the Daily News and other outlets spoke to both the Philadelphia Police Department and the LAPD. Right now there is no hint of anything beyond what the NJ.com story reported - a friend who raps for Jackson's label was tried and acquitted of a 2010 murder, and in 2012, somebody was killed in front of a building leased by Jackson's sister. And, as Jackson's 667,000-plus Twitter followers already knew before NJ.com reported it, he has been photographed many times throwing gang symbols, as have countless other athletes and celebrities. Of course, the Eagles are free to try to keep the waters muddy by leaking details of D-Jax transgressions over the years. That has often been their practice in such matters. But those would be situations they knew about, and tolerated, not new affronts. Had the Eagles decided to stand by Jackson, it would have been interesting to see what public reaction to the NJ.com story would have been. Was it a fair representation of his lifestyle? By releasing him so quickly, the Eagles gave the story much more credibility than it might have earned otherwise. There are a lot of questions the Eagles are going to have to answer about this, at some point. Throughout the weekend, they kept instructing a team spokesman to respond: "We have no further comment at this time," when someone would ask if team chairman Lurie, general manager Roseman or head coach Kelly were available. Now, because they couldn't find a trading partner, the Eagles might watch their game-changing weapon sign with a division rival. The Redskins wouldn't be hosting Jackson if they were real worried about his associates, or about any sort of pending revelations. The other teams lining up don't seem too concerned, either. Yesterday's Long Beach (Calif.) Press-Telegram contained a story about Jackson's high school, Long Beach Poly, where coaches and administrators were rallying behind him in the wake of the NJ.com story. Former football coach Raul Lara, who was quoted by NJ.com in a way that Lara felt made it seem he was saying Jackson drifted toward gang figures after his father died in 2009, told the Press-Telegram his quotes were misconstrued by NJ.com. "Gangbanger, what the [heck] is that about? All I was saying was that it was a tragic part of his life when his father died. He's not a gangbanger. I don't know where they're getting that from, and I didn't say that he was," Lara said. The Press-Telegram notes that Lara "has been a probation officer in the Los Angeles County juvenile courts system for more than two decades and has extensive experience working with young people in gangs." The Eagles' concerns about Jackson were not rooted in gang affiliation. They had legitimate issues concerning his practice habits and his approach to his craft, as a face of the franchise. If Kelly felt he could not build the kind of locker room culture he needs in order to win a championship around such a $10.5 million-a-year obstacle, that young players might wonder why they needed to be punctual and self-sacrificing when the star wasn't, well, that makes sense, though the question I asked Kelly on Wednesday at the NFC coaches' breakfast still seems relevant: How is the offense better without DeSean Jackson? "It's never been about just one guy . . . We were first in rushing and I think ninth in passing. I think there's balance in how we do things," Kelly said then. "You want great players at every position . . . but it's never been predicated on just one guy, because if it is, if he's out for a water break or hurt for an extended period of time, then you're going to be in trouble." Sure, but it says here that if LeSean McCoy, Nick Foles or Jason Peters is hurt for an extended period of time, the Eagles are indeed in trouble, whether "it's about one guy" or not. And they are weaker without Jackson. It's easy to see how the Redskins' offense might be better with him. They have a quarterback who can extend plays and wait for him to get open. They have a top-notch running back, and a new head coach, Jay Gruden, with a strong offensive resume, and more than $7 million in cap room. It'll be interesting to see what sort of contract he eventually receives. When Jackson dropped to 49th overall in the 2008 draft, after earlier having been projected to go in the middle of the first round, he decided he had to prove everyone wrong who felt he was selfish or not dedicated. He really attacked drills, made himself known for working hard. That was a long time ago. A lot changed. Jackson's desultory 2011 season is an anchor he will wear for the rest of his career, along with those diamonds on his neck he rapped bout. It's worth noting that Kansas City's Andy Reid, the coach who put up with that 2011 poutathon, and who clasped Jackson to his ample bosom afterward by pushing for No. 10's 5-year, $48 million extension, apparently has decided not to get involved with him this time, after looking into it. But in a new setting, for a year at least, the team that signs Jackson might see that 2008 player again, the one who had something to prove, and did. And the Eagles will have to be extremely lucky in the draft to find a receiver who can make three Pro Bowls in six seasons.